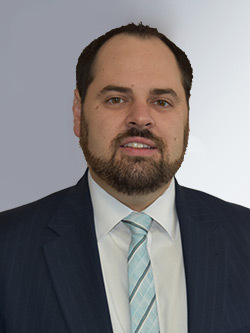 Gregory H. Booth began his legal career practicing as a personal injury and workers’ compensation attorney in Chicago, Illinois. After refining his litigation techniques and skills, he returned to Aurora, Illinois to open his own firm. Prior to joining Meyers & Flowers, Greg had the pleasure of working alongside his father, Robert P. Booth, who represented injured parties in Kane County for nearly 40 years. Mr. Booth received his law degree from The University of Dayton School of Law in 2010. While in law school, Greg was a member of the Moot Court Team and a teaching assistant for Appellate Practice and Procedure. Greg received an undergraduate degree from Marquette University in 2007. As an undergraduate, Greg spent a semester abroad in Madrid, Spain where he honed his Spanish language skills. Greg is licensed to practice law in the State of Illinois. He is a member of the Illinois Trial Lawyers Association (ITLA), the Illinois State Bar Association, the Workers’ Compensation Lawyers Association, and the Kane County Bar Association. Mr. Booth has been selected as one of the “10 Best” for Client Satisfaction in Workers’ Compensation by the American Institute of Legal Counsel in 2016. Mr. Booth was born in Aurora, Illinois and is a lifelong resident of the Fox Valley. He attended grade school at Holy Angels in Aurora and high school at Marmion Academy. Greg is also a homebrewer and has won multiple awards at competitions throughout the country. Greg and his wife, Carmen, reside in Aurora.